I received an email from Nigel’s Beauty Emporium saying they were having another master class later this month. I have been to a few classes at Nigel’s and I have found them informative and fun. After a while though, beauty makeup is beauty makeup. If you are like me, you feel like if you’ve seen one, you’ve seen ’em all. However this line might be different. This master class is being taught by makeup artist, Carly Cowan, using the Ellis Faas cosmetic line. I was intrigued because I had not heard of that line before. So I did some research on Faas and found out that she is a Dutch born, internationally know fashion makeup artist. 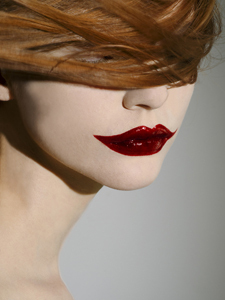 Nigel’s touts that French Vogue called Ellis Faas “One of the most influential makeup artist of her generation.” After looking at her work, I can see why. I definitely want to find out more about Faas and her line of cosmetics. Going on my wish list! I have not tried the products yet, but the colors look bold and vibrant. Most of the products are fluid (lipstick, eyeshadow, blush & foundation) and come packaged in a waterbrush style wand, where the product is pushed up into a brush applicator or sponge. Plus, the packaging is so sleek and futuristic it makes me want to take a closer look. I am digging the the Definitely going on my MD Shari Wish List! Here Faas explains how her line came about. Find out more about Ellis Faas Cosmetics at.. Please feel free to leave comments and let me know what you are thinking. If you have tried Ellis Faas productions, I would love to hear from you! Hi Beautiful, Do you love movie makeup and the film industry? Enter your email address to subscribe to this blog and receive notifications of new posts by email.